Bromeliads have beautiful foliage, but they are often sought after for their inflorescence and the colorful leaves that accompany blooming. Unfortunately bromeliads, with the exception of a few genera, bloom only once. New plants will grow, but often they need some encouragement to produce a new flower. Most nurseries force their bromeliads to bloom so they have attractive color or inflorescence by the time they arrive at the point of sale. Bromeliads are more enticing when they are full of color. This means that you will get to enjoy the color and inflorescence for a few months and then the flower will fade and eventually the plant itself will die. Before the plant dies it will produce offsets or “pups.” These pups are exact copies of the parent plant. Therefore, the new plants will produce the same colorful bracts or inflorescence as the mother plant. This takes time. Some bromeliads can take three years or more to reach maturity and produce a new flower. However, you can speed the process along. Using natural or chemical means to encourage flowering is called forcing. It is possible to force a bromeliad to bloom before it is ready. First you must decide what you will do with the pups. The pups can be removed and repotted individually. You should wait until the pups are at least one-third the size of the mother plant. Waiting until the pup is half the size of the mother will give your pup an even better chance. You can also leave your pups attached in a clump to the mother plant. Simply remove the mother plant with a sharp knife when it becomes unsightly. Once the pup has matured you can force it to bloom. It may take up to a year for the pup to be ready for forcing, but some varieties will be able to establish faster. For more information on transplanting pups see this post. An easy way to try to force your bromeliad to bloom is the ‘apple in a bag’ approach. First you need to find a clear plastic bag with no holes in it. It should be large enough to fit the entire plant container and bromeliad inside. Garden centers or even aquatic pet stores should have bags like these available. Remove any water that may be sitting on the plant. The central tank and leaf axils must be empty. Then place the whole pot in the bag with a ripe apple. Tie the bag shut at the top and make sure there are no openings. Let the plant sit in the bag with the apple for 7-10 days. Make sure the pot is kept in a shaded area as too much direct sunlight could damage the plant. Finally remove the pot from the bag. 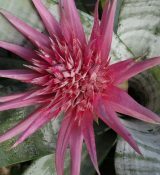 Six to fourteen weeks from when you remove the pot the bromeliad should begin to show signs of blooming such as colorful bracts or inflorescence. It is the ethylene gas that is produced when the apple ripens that stimulates the bromeliads to bloom. There are also chemical versions of ethylene available. They can come in gas, liquid or a crystal form. Unless you are a commercial grower you will most likely want to use the liquid form. Commercial growers often use the gas, but it is much more difficult to work with. Tropiflora, a bromeliad producer and seller, recommends Florel, but anything with the active ingredient Ethefon will work. There are several different products on the market. The products have varying concentrations of Ethefon so be sure to follow the manufacturer’s instructions for handling and dilution closely. Only mix what you will need and throw away any extra after treating the plants. The active ingredient becomes inactive very quickly once diluted with water. You should not use the product more than four hours after it has been mixed. Spray the top surface of the plants with the mixture so they are just covered, but not dripping. Alternatively, you can add about an ounce of the mixture to the central tank. The advantage to the chemical method is that it is slightly faster than the apple method. It will still be 6-14 weeks from the application of the product to the bloom, but you do not have to wait the extra 10-14 days that the apple must sit in the bag. -Enjoy the wild beauty of bromeliads. A few other conditions must be in place before you force your bromeliad to bloom. 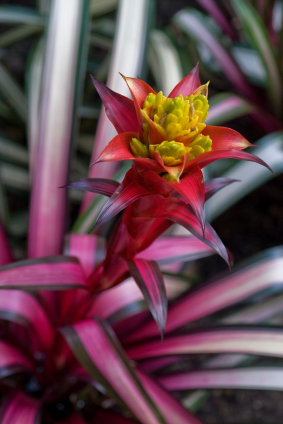 You should not fertilize your bromeliad two weeks before you force the bloom until two weeks after the bloom begins. Temperatures at night should remain consistently above 65 degrees during the time you are forcing the bloom. 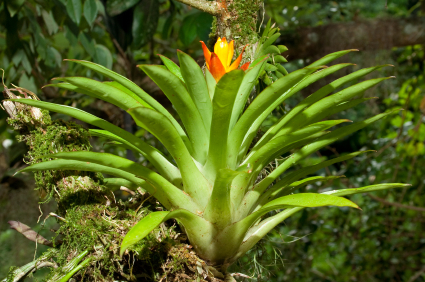 Be aware that different bromeliad species will respond differently to forcing. Some may take longer than others to flower. It may take some trial and error to determine exactly how long it will take a certain bromeliad to bloom. In general, Guzmania, some Aechmea and Vriesea genera respond very well when forced to bloom. If you have been patiently waiting for your bromeliads to bloom, there maybe a reason your bromeliad has not produced any inflorescence. Too much or too little sunlight may prohibit a bromeliad to bloom. Sunshine Coast Bromeliad Society warns that bromeliads are often reluctant to bloom when fertilized with too much nitrogen. The nitrogen will keep the bromeliad growing and producing pups, but it will delay flowering. They recommend using a fertilizer with Nitrogen 3.0, Phosphorus 8.0, and Potassium 25.0 plus trace elements. This combination will put enough stress on the plant to produce color and a bloom quickly. Bromeliads are forced to bloom for various reasons. Growers force blooms so that the plants will be colorful for sale during certain seasons. Pineapples are forced by growers to bloom so that they produce fruit at the same time making harvesting easy. Horticulturists force blooms so that they can create crosses between varieties that would normally bloom at different times. Many hybrids would be impossible without forced blooming. Hobbyists force blooms to keep their bromeliads colorful and beautiful as often as possible. Whatever your reason forcing bromeliads to bloom is a simple and easy process. Forcing Bromeliad blooms requires only an apple and a little patience. With a few short steps you can have your bromeliad blooming in 3 months instead of 3 years. Have you had any luck forcing your bromeliad to bloom? What methods have you tried? I bought a bromeliad from a supermarket. It had an attractive pink inflorescence. 2 days later a 3 petalled bluish-purple flower emerged from the inflorescence. I would like to know the name of this bromeliad. It looks very pretty. I just got the same plant. It’s called a Pink Quill, also known as “King Kamehameha’s pink paddle”. Thanks Carol. The bluish purple flower eventually faded and dropped off. No more flowers appeared. The pink inflorescence has now turned green. Plant still looks healthy. Several ‘pups’ at the base. Sounds like you have several happy bromeliads! If you know what kind, you can download one of our cheat sheet care guides from our Resource Page for their specific needs. Once they are finished blooming, they may produce pups (baby bromeliads) which you can separate when they are at least 1/3 the size of the mother plant and repot as your future generation of bromeliads (the mother plant will eventually die). If you have any specific care questions don’t hesitate to let us know! 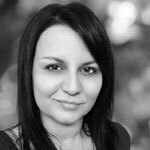 wondering what to do once the flowers start dying – is it ok to cut them off? does this make a difference to the growing of the pups? Yes, it’s perfectly fine to go ahead and cut off the dying flowers. Later, once the pups reach about a 1/3 to 1/2 size of the parent plant, you can go ahead and cut them off (cutting as close to the mother plant as possible). someone sent a bromeliad at my dad’s funeral. i think ,am almost positive, that i overwatered it. should i repot it so the soil will be dry? I was given a bromeliad and it is absolutely beautiful. I keep it indoors. I was just wondering what its life span is and if it would grow bigger. Should I repot it when it grows larger? Here is an article that should help you with repotting your bromeliad. Let us know if you have any additional questions. THE bract OR PADDLE PART OF MY PINK QUILL IS MOSTLY GREEN WITH just a bit of pink on the end. Does anyone know why? Can I do anything to make it Pink? It has been producing flowers but i think it’s done. So now I just have to wait for the offsets to grow re pott them and wait a few years for more flowers?? I was this as a gfift and it is an awesome plant I want to help it grow. I have this same problem. Any answers out there???? Most bromeliads only bloom once in their lifetime before producing new plant offshoots. If cared for properly, these new bromeliad pups will give you that beautiful bloom once again. Our Tillandsia Cheat Sheet will give you some care tips including an overview of Tillandsia propagation. Rachel, I believe that this may be because your bromeliad plant is dying.. I have a bromeliad plant in my possession; after the bract began turning green, the flower lost its color. I believe that is is because the plant is dying, though I myself am not an expert. THE PINK COLOUR OF THE QUILL BEGINS TO FADE AND TURNS GREEN WHEN THE TILLANDSIA FINISHES FLOWERING. i SUPPOSE THIS IS WHAT IS HAPPENING TO YOUR PLANT. iT WILL THEN TURN YELLOW AND WILT. aT THIS POINT YOU CAN SNAP IT OFF THE MOTHER PLANT. Do I cut the apple to force blooming or place one or two entire apples in the bag. I understand that the ethylene gas comes from the apple skin. Is that correct? When placing apples in the bag, do I cut them up or place them whole around the base of the apple or bottom of bag? I just purchase my pink quill and the purple flowers dropped off. the quill portion that was a beautiful pink and lost its color and is a very pale green. is this normal? does the color ever come back? Thanks! Does that beautiful color ever return to the quill? I followed the instructions for the apple in the bag advice to have the bromeliad re-bloom. The new flowering shoot was starting as i removed it from the bag. soon i will have a beautiful new flower. very excited and very thankful for this advice. Wonderful, we’re happy to hear it! How big should the pups be before forcing them to bloom. I don’t remember how tall the mother plant was, but I have had the pups for at least a year and a half. Judi it sounds like they are probably ready for separation. Typically once they are 1/3 the size of the mother plant and/or have started growing little roots of their own. I’m not sure this is a Bromelaid but when purchased at the florist it had a gorgeous light pink bloom!! The pups don’t seem to have visible roots, can I root this??? Hi Cindy! Unfortunately we can’t see the image here. Can you email us through the contact page? So, essentially, when you buy a forced bloom Bromeliad, you have bought a “dying” plant? The bloom will last around 3 mos. but the plant is going to die soon? Just watch for “pups” to replant. Interesting plant. Very much like Pineapple plants. My Dad has grown several pineapples from store-bought fruits. He just plants the tops. But it takes a LONG time to grow them. My pink quill bromeliad has begun to turn green, however it never produced any flowers from the quill. I can’t see any pups forming. Have I lost it? Or should I just accept it won’t flower and hope for pups? I have used spray fertiliser and water, I think is has enough bright but not direct sunlight. I wondered the same thing I bout the bromiliad when the quill was pink and it never bloomed. Now it’s is turning green. I was told to only water it in the center about 1 oz a week. Do I need tondo anything Else? It is planted at the base of an orchid. Orchid has been blooming a month now.